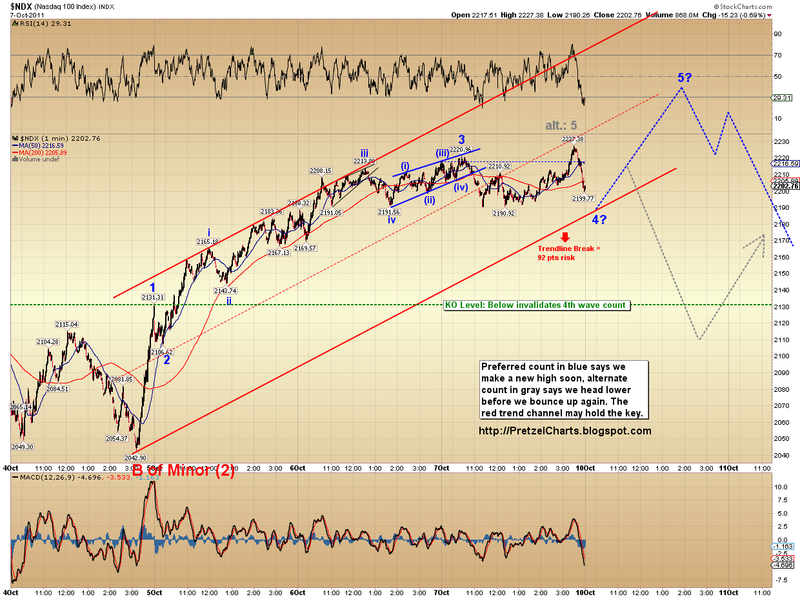 Just a quick update to this post and the short-term NDX chart after Friday's action. The projection chart I drew for Friday played out fairly closely. Below: the projection chart from Friday is shown first; the updated chart with the actual result is shown second. My preferred count (shown in blue on the chart): The wave structure at the smallest time frames seems to indicate that 2227 was probably not the 5th wave at all, but was instead the b-wave of an expanded (or running) flat -- in other words, it was part of wave 4. If the 2227 high is indeed part of the 4th wave, we may (or may not) see a little more downside, but either way we'll head to new highs immediately after in wave 5. Another thing that raises my confidence in the preferred count is the position of the SPX (as detailed in the SPX Weekend Update), which did not make a new high after Friday morning, yet similarly appears to need a new high to complete the structure. The key level on the NDX is 2131.31: this is the knockout level for the preferred count, so trade beneath that price (without making a new high first) would eliminate the preferred count completely. The alternate count (shown in gray) opposes the blue count, and runs with the idea that the 2227 high was the high for wave 5, meaning we are now due a deeper correction. I would genuinely be surprised if this turns out to be the case, but it is certainly possible. So Monday's action should give us our answer, probably fairly quickly. 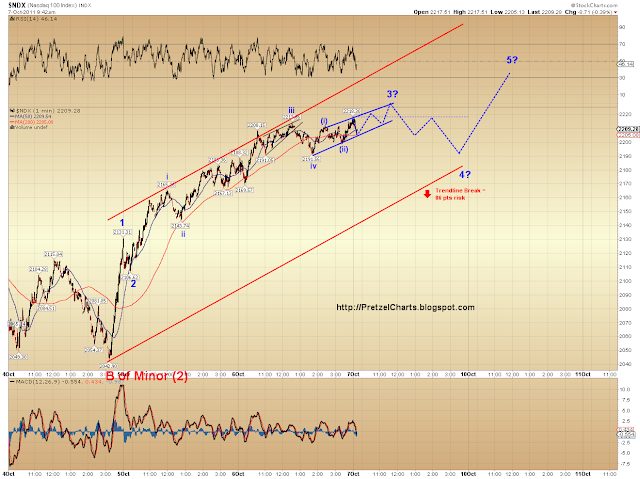 The red trend channel line may or may not provide some clues when the market reaches it. Having any faith in the red trend channel is a bit of a leap at this point, because the bottom line has yet to be tested at all, so whether the market "sees" it or not is yet to be determined. Pretzel, spot on! NDX ended at 2278 today. Which is exactly where you had wave top 5 project -blue line- (using some extrapolation of the y-axe on your two NDX charts). On a whole different note; did you read the article on saturday on USATODAY.COM? "Think the economy's bad? 'You haven't seen anything"
It -based on several of the markets top thinkers (not specified who they are in the article)- describes exactly the elliot wave you've outlined for us so far: These top thinkers/analysts predict the market to go up/peak over the next three months (as historically the last 3 months of the year have always been good/bullish), but then in 2012 it will go bad, really bad, with some of them predicting S&P500 in the 700s... The reasons are several with some the same as you described: investors' memory of 2008 still fresh and the sell-off will be even more than back then. Eitherway, this is exactly the pattern you describe and predict! Personally, I think China will go "down." Why? Growth isn't double digits anymore with last quater "only" 9.5% or so. Some "overheating" (housing bubble) is already being reported from China. The next (4th) quarterly 2011 numbers -out early next year- and annual numbers (later next year) will IMHO show even less growth. Probably "only" 5-8%!? Not surprisingly since the economies it is exporting to the most (USA and EU) are down and thus not buying the Chinees goods. And to get the financial markets to loose 40-60+% of their current and coming highs we need a giant to "crash to it's knees". That can only be China IMHO, also because the current mess in the EU has mostly already been passed on into the markets of today. And I don't expect that mess to become much worse. In addition, the US' troubles cause '08 crash so that's also behind us. Thus logically there can only be one "giant" of the three left: china. Just my 5 cents for what they are worth. Now we have to see if both the elliot wave comes to a completion and if my ideas of why that is are right (everything happens for a reason ya, so even the elliot wave need reasons to behave as it does and since these reasons are human-drive, China maybe key in this whole story). Thanks, Arnie. It always feels good to nail a projection after pouring over charts for hours on end... especially when most other people were calling Friday as the top of this leg. The 5th wave has now completed the minimum projections for both the SPX and NDX -- so the question tonight will be if that's all there is to this leg, or if the 5th wave will extend. Have to look at the charts in more detail later. Thanks for the article link, I skimmed through it and will read it in more detail later. I tend to agree w/ you on China. I haven't posted a chart of the Hang Seng, but I track foreign markets periodically, and it looks due to enter a large 3rd wave down in the near future. It may crash ahead of the US. Next weekend maybe I'll do some more detailed coverage of that index. pretzel, a Hang Seng analyses would be very useful to bring everything into perspective. I can see that a crash will send global markets spiraling down.